We are excited that the ATD International Conference and Expo is coming to our area! 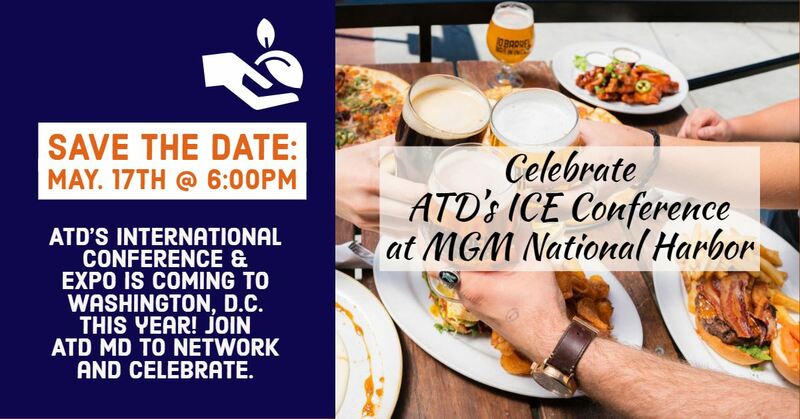 Join us at MGM National Harbor (Oxon Hill, MD) to connect with conference attendees from across the globe, network with ATD Maryland members and enjoy the Harbor activities! We will meet up at the TAP Sports Bar for happy hour/dinner. Conference and non-conference attendees are welcome. If you work in the area, feel free to join us after work! *This is an informal networking event hosted by the ATD's Maryland chapter. We have a group reservation, but seating is limited, please register if you plan to join us. Note: There is complimentary, on-site garage parking at MGM National Harbor. Visit: https://www.mgmnationalharbor.com/en/amenities/mgm-national-harbor-parking.html for more options.